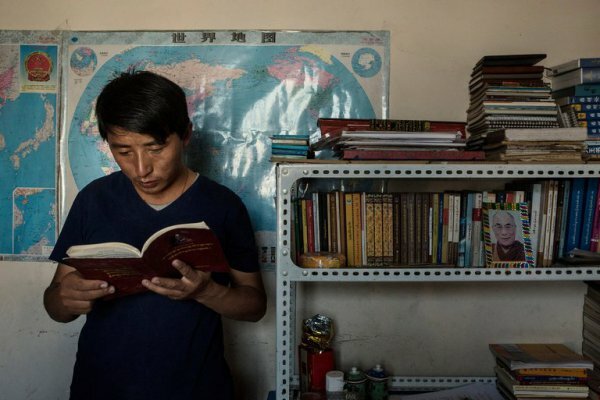 Tibetan language activist Tashi Wangchuk has been convicted to five years of imprisonment for "inciting separatism", after he campaigned to preserve his native language. Tibetan language activists are very concerned about the survival of their culture and are worried that children won’t be able to learn Tibetan, as China keeps adopting more assimilationist policies. Recently, Chinese authorities have launched a campaign in Tibet which encourages to report on others, which aims primarily at identifying dissidents. The UNPO calls upon China to drop the charges against Tashi and strongly condemns the criminalisation of freedom of expression of minorities in China. A Tibetan businessman who campaigned to preserve his native language from the encroaching dominance of Chinese was sentenced to five years in prison on Tuesday [22 May 2018], after a contentious prosecution based on interviews that he gave to The New York Times. The businessman, Tashi Wangchuk, heard the verdict in Yushu, a heavily Tibetan town in Qinghai Province, northwest China, his defense lawyers, Liang Xiaojun and Lin Qilei, said by telephone. Mr. Tashi had warned that there and across many historically Tibetan areas in China, the Tibetan language was threatened by official policies to make Mandarin Chinese the language of schooling and government. Mr. Tashi, 33, was arrested in early 2016, two months after he was featured in a New York Times video and article about Tibetan language education. He stood trial in January this year, charged with “inciting separatism” for comments he had made to The Times. His prison term will start from the time of his arrest, meaning that he will be due for release in early 2021, his lawyers said. “Tashi already told us before the verdict that he wanted to appeal if he was found guilty,” Mr. Lin said. The two lawyers were not at the hearing in the remote town, but said Mr. Tashi’s family told them of the verdict. The guilty verdict came as no surprise. China’s Communist Party-controlled courts rarely find defendants in criminal trials innocent, and virtually never do so in politically charged cases like this. But human rights organizations and advocates of Tibetan self-determination promptly denounced the verdict as a sign of the Chinese government’s growing intolerance of critics of its ethnic policies, even relatively mild ones like Mr. Tashi. “He has been criminalized for shedding light on China’s failure to protect the basic human right to education and for taking entirely lawful steps to press for Tibetan language education,” Tenzin Jigdal of the International Tibet Network, a coalition of groups supporting Tibetan self-determination, said in an email. The Chinese Communist Party for decades maintained policies intended to keep ethnic minorities, especially Tibetans and Uighurs, under political control while giving them some space to preserve their own languages and cultures. But under Xi Jinping, the staunch Communist Party leader who came to power in 2012, China has adopted more assimilationist policies, designed to absorb these minorities into the fold of one Chinese nation. At his trial in January, Mr. Tashi, speaking in Chinese, rejected the idea that his efforts to rejuvenate the Tibetan language were a crime. He has said that he does not advocate independence for Tibet, but wants the rights for ethnic minorities that are promised by Chinese law, including the right to use their own language. Mr. Tashi studied for three years in a Buddhist monastery, and taught himself to write Tibetan with the help of a brother. He ran a shop in Yushu that sold local goods in person and online, and was shown in a promotional video in 2014 for Alibaba, the giant Chinese internet trader, as an example of entrepreneurial success. Yushu, called Gyegu in Tibetan, is one of the predominantly Tibetan areas of China that lie outside the official Tibetan Autonomous Region, and the government has encouraged increasing use of Chinese language in schools and official settings across these areas. In 2010, an earthquake struck Yushu that killed about 3,000 people. The government rapidly rebuilt the main town, but critics have said the burst of construction accelerated the erosion of the Tibetan social and cultural fabric. While most Tibetan residents in Yushu still converse with one another in a Tibetan dialect, Mr. Tashi worried that the growing primacy of Chinese would leave future generations of Tibetans strangers to their native language. Tibetans speak a variety of dialects that experts say are under threat, and Tibetan language activists like Mr. Tashi have been especially worried that children will lack the ability to read and write in Tibetan. A nine-minute video documentary also made by The Times with Mr. Tashi’s cooperation showed him traveling to Beijing in 2015, in a failed attempt to bring a lawsuit forcing officials in Yushu to improve Tibetan language instruction. Mr. Tashi also tried in vain to get the main Chinese state television network, CCTV, to pay attention to his cause. Mr. Liang, the defense lawyer, said that those words were among the comments cited by the prosecutors to argue that Mr. Tashi was inciting separatism, a vague charge that can lead to a prison sentence of more than five years. Todd Stein, a former United States State Department official who dealt with China and Tibetan issues, said by email that the prosecution of Mr. Tashi raised difficult questions about how journalists should report on people whose views may rile the Chinese government. Mr. Tashi told Times journalists that he did not support Tibetan independence and just wanted the Tibetan language to be taught well in schools, and for Tibetan to be used in government offices. Asked about the risks of speaking out, Mr. Tashi had insisted on doing on-the-record interviews, saying that only those would give force to his words.